This is one of the first generation of Tardiana-type hostas created by English hybridizer, Eric Smith in 1961. It was registered by British Hosta and Hemerocallis Society on behalf of Smith in 1988. This medium size (18 inches high by 43 inches wide) plant is a hybrid of H. 'Tardiflora' × H. 'Elegans'. The foliage has smooth texture, slight waviness and thick texture. Pale bluish lavender flowers on 28 inch high scapes bloom from late July into August followed by viable seeds. 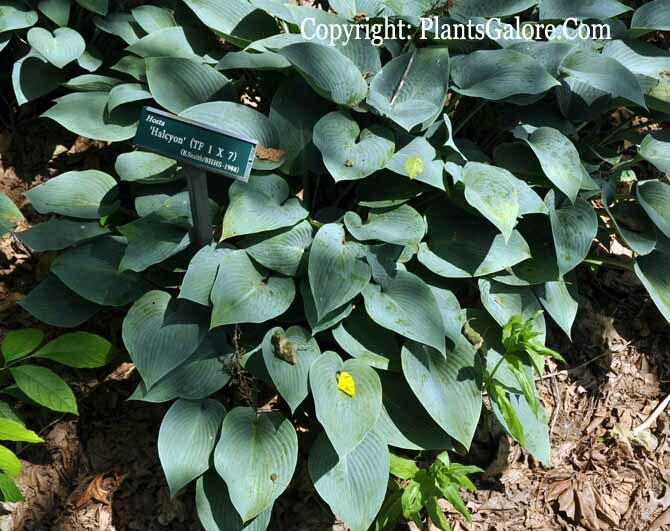 According to The Hostapedia by Mark Zilis (2009), "If you are limited to only one Tardiana by law, or for that matter, one blue-leaved hosta, then 'Halcyon' should be your choice. It probably best exemplifies what Eric Smith was after when he hybridized 'Tardiflora' with H. 'Elegans', i.e. 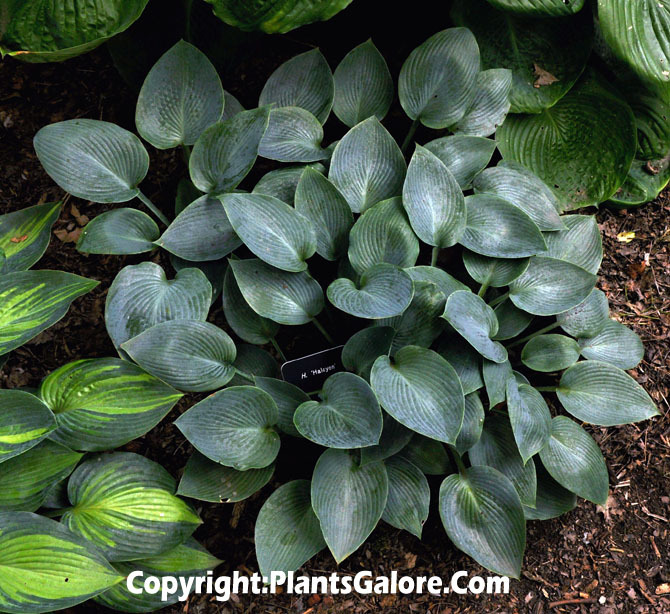 fast growing, medium-size, blue-leaved hostas...a great source of sports and is a superior breeding plant...I have always thought that if someone wanted to develop an evergreen hosta, they should start with 'Halcyon'." From the Field Guide to Hostas by Mark Zilis (2014), "Out of all 34 named Tardianas, 'Halcyon' ranks as the most well-known and widely propagated. It has proven to be a superior garden plant..."
The New Encyclopedia of Hostas by Diana Grenfell (2009) states: "A benchmark for all hostas in the Tardiana Group. The original H. 'Halcyon' is usually now only seen in older collections, since seed-raised strains and the advent of tissue culture have bastardized it...Winner of the 1987 Alex J. Summers Distinguished Merit Hosta Award." From The Hosta Journal, (2002 Vol. 33 No. 2), "...'Halcyon', 'Devon Green' and 'June'...are the same hosta but with different-colored leaves." An article about the Halcyon Group by Peter Cross in The Hosta Journal (2004 Vol. 35 No.2) says, "Though 'Halcyon' is not the bluest hosta now available, no blue hosta has yet to match the balance of color, size, habit and growth rate that has made 'Halcyon' the classic medium-sized blue hosta...One simply doesn't have a hosta collection until it contains at least one clump of 'Halcyon' ...is a first-generation member (TF 1 × 7) of the legendary Tardiana Group of hostas, which consists of hybrids of 'Tardiflora' × H. 'Elegans', produced in England by Eric Smith, the master hybridizer of blue hostas, in the 1960s." ....The first sport...was aptly named 'Goldbrook Glimmer', discovered by Sandra Bond of Goldbrook Plants in England...features a narrow "glimmer" or blaze of green down the middle of the blue leaves...The variegation is most pronounced in cooler climates and early in the season...In especially warm climates, the mound will appear a solid blue by the end of the summer. ....I have difficulty choosing a single favorite hosta but, when I am pressed, more often than not H. 'June' is my choice. This queen of hostas is the best-known sport of 'Halcyon', taking the dusty blue leaves of the parent and adding a splash of yellow to the centers of the leaves...As with 'Goldbrook Glimmer', climate plays a huge part in the appearance of 'June'. It needs a little bit of direct sun early in the season to bring out the brightest golden-yellow tones in the centers of the leaves, while cooler temperatures are needed for the best blue coloration. (Specimens of 'June' that I've seen in Britain and New Zealand surpass all description.)... (At one time 'Kryptonite was thought to be a sport of 'Blue Wedgwood', but it is now generally held to be a sport of 'Halcyon'.)" An article by Warren I. Pollock in The Hosta Journal (2010 Vol. 41 No. 1) states that, "Not long ago the Margin Halcyon Series comprised just three sports of 'Halcyon' ...'Sleeping Beauty'...'First Frost'...El Nino...new members have been recently introduced...'Great Escape'...and 'Blue Ivory'...Curiously, the patent for 'El Nino' states it is a "hybrid of 'Halcyon' × a selection of H. 'Tardiflora'...Hosta authorities agree that most likely 'El Nino'is not a seedling of 'Halcyon', but a sport of 'Halcyon' found in a tissue-cultured batch in the Netherlands." This cultivar has appeared several times in the Popularity Poll by members of The American Hosta Society. It has also been awarded the Royal Horticultural Society's Award of Garden Merit in the UK. H. 'Halcyon' - The benchmark for blues...Whenever I see a new blue hosta, I take a leaf and place it next to 'Halcyon' as my standard. H. 'Winfield Blue' another consistent blue. H. 'War Party' - Holds its bloom well into late summer...resembles a plant from the Tardiana Group except it has a larger growth habit with a mature clump spreading over 4 feet. H. 'Blue Angel' - Deservedly popular in Indianapolis gardens...The size and color make it a classic. H. 'Blue Betty Lou' - Upright growth, leaves that are characteristic of H. 'Sieboldiana' and a powder blue bloom, has been a favorite since I first saw it. H. 'Blue Blush' - Finding a smaller hosta with good blue color plus a decent growth rate is difficult. H. 'Blue Blush' fills this need.